← Frequently Asked Questions: What are facet blocks? At Center for Spine Care, we are continually evaluating new technology and assessing whether new techniques or devices help us to offer the most advanced, cutting-edge options for our patients with conditions and ailments of the spine. We diligently investigate and assess these new devices to be certain that they are effective and safe before incorporating them into the operating room. Often this involves working with new technology in training labs, and corroborating with industry manufacturers to ensure the validity of these therapies. Data and evidence through stringent clinical trials are crucial to popular acceptance of new technology so that there is limited risk to patients. 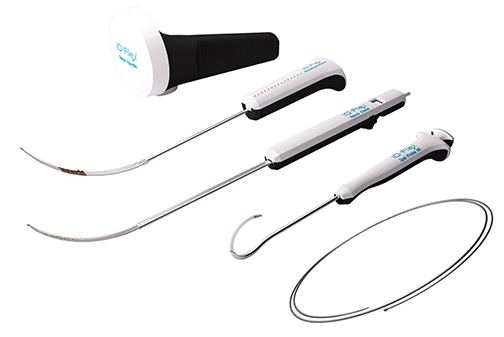 One such device that we have found to be a great advancement in minimally invasive technologies is the iO-Flex® device by Baxano, Inc. (San Jose, CA). iO-Flex® is a MicroBlade Shaver® that directly removes ligament and bone to relieve spinal stenosis through a minimally invasive approach. It works much like a flexible nail file that has a rough shaving service and a smooth back surface that shaves away bone and ligament while preventing injury to the nerves and blood vessels. The design rationale for this device is to address stenosis in the portion of the spine called the foramen, which are the bone tunnels through which the nerves exit the spinal column. Foraminal stenosis often involves the facet joints themselves and traditional methods of decompressing the foramen run the risk of injuring and potentially destabilizing the facet joint. The integrity of the facet joint is crucial maintain biomechanical stability of the spine, as an unstable spine can cause significant pain and dysfunction. Surgical decompression of the foramen with traditional methods can lead to either not getting an adequate decompression of the foramen in order to avoid disturbing the joint, or over-decompression leading to instability of the spine and possible need for fusion. With iO-Flex®, we now have a device that allows us to decompress the foramen from an inside-out approach, with controlled back-and-forth motion to essentially directly shave away the stenotic bone and ligament. This results in decompression of the foramen and relief of nerve compression while preserving the joint and ultimately the stability of the spine. 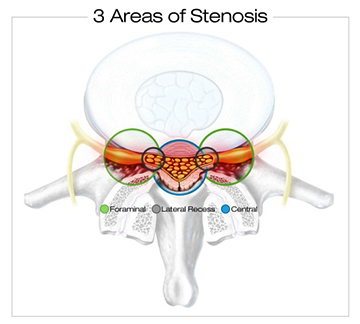 Patients with lumbar stenosis are potential candidates for this procedure. Stenosis is the process by which nerves are compressed by progressive changes of wear and tear on the spine resulting in bone spurring, ligament thickening, and disc bulging. This narrowing may then result in low back and leg pain and weakness. Stenosis is the most common surgical condition of the spine in patients over the age of 55, but can begin developing as early as the patient’s 30’s. Specifically, patients with leg or back pain due to degenerative disease of the spine with stenosis in the foramen are typical candidates for this procedure. 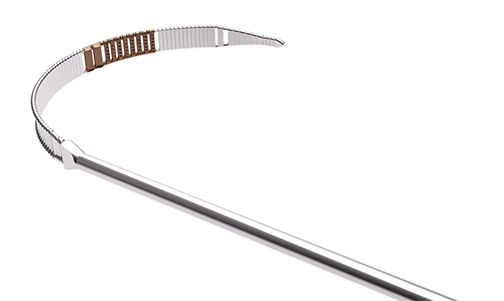 The iO-Flex® is used as an adjunct to our usual minimally invasive laminectomy and decompression procedure, so it fits seamlessly into our normal surgical routine. At Center for Spine Care, we have been using the iO-Flex® device over the last year or so and have had excellent results in carefully selected patients. The iO-Flex® device is one of many advanced, minimally invasive technologies we use at CSC to better care for our patients with spinal conditions in a safe and effective way. This entry was posted in New Technology, News. Bookmark the permalink.